I was juggling with ideas about edge lands and terminal wastelands and that kind of thing when I was trying to find a title for this post, which is a kind of prelude to something coming up in a couple of weeks when I made the connection with another post featuring the photographs of Bernard Selwyn which I called On the border. 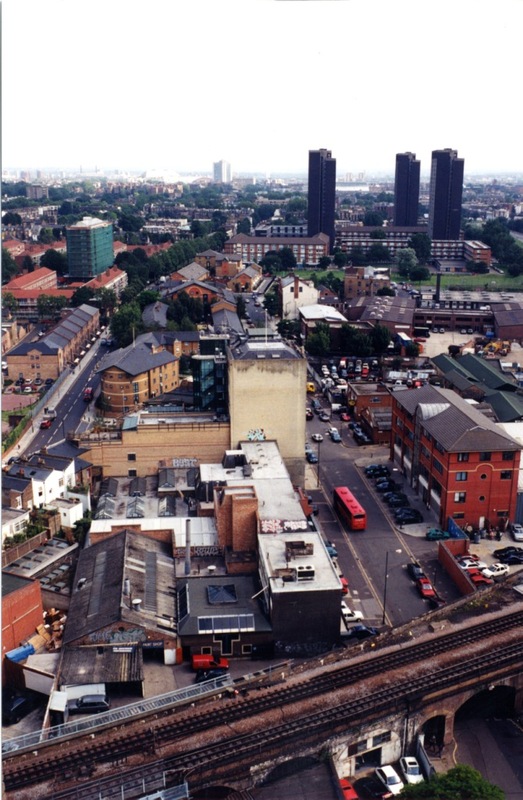 That was set in the south west tip of the Borough in the area next to Fulham where Chelsea Harbour was built. 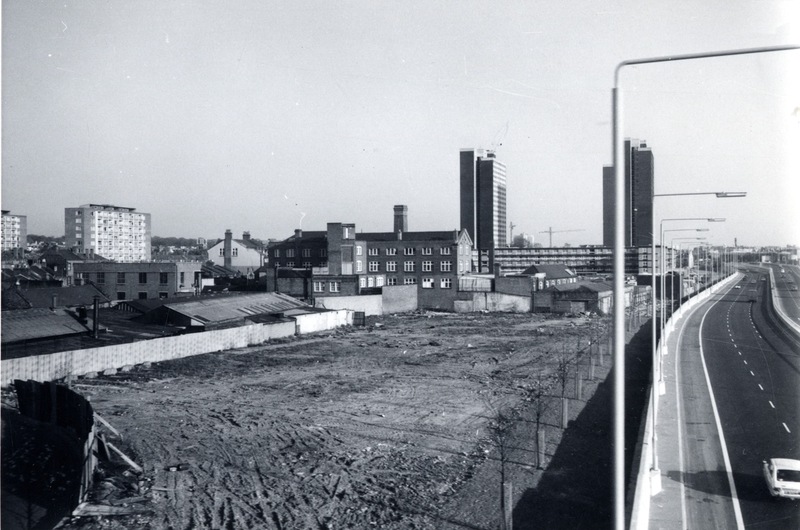 This week, we’re right at the border with Hammersmith looking at an area in the throes of development in 1971. 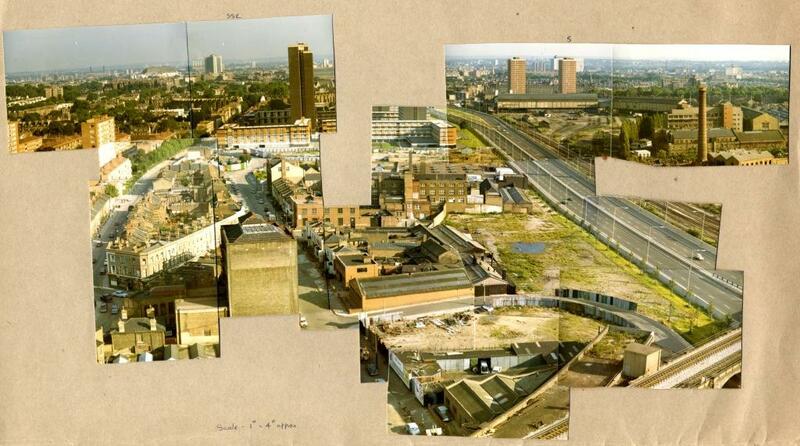 I should explain that the man who took the pictures which make up this photo collage, Bernard Selwyn, was a professional surveyor with an abiding interest in the history and development of west London. A few years ago he left the Library in his will a mass of material – notes, photocopies, maps and above all photographs. One of our volunteers spent a couple of months or more combing through this material and arranging it by subject in a set of boxes and plastic crates. Since then I (and Isabel) been able to draw on it for a variety of purpose including a few posts on this blog. In this case Selwyn is standing near the top of Frinstead House looking south. The road on the right is the West Cross Route. (which I imagined would have changed its name by now, but that name still appears on maps.) At the centre rear you can see one of the towers of the Edward Wood estate. 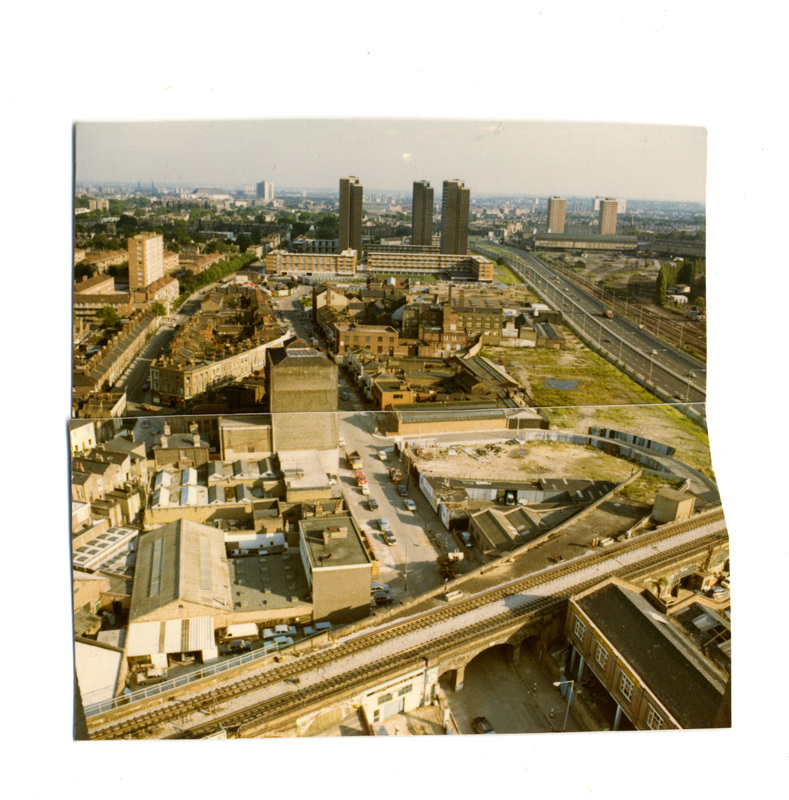 We’ll fill in the gaps with some later pictures, but first look at the foreground where you can see the elevated railway line and what remains of a spur line which went into Hammersmith. You can see it better in this picture. And again in this close up view. Note how light the traffic is on a major road to Shepherd’s Bush. Some of these colour prints are tiny by modern standards but the colour has lasted well and they give us a detailed view of these spaces between roads and rails and industrial sites. 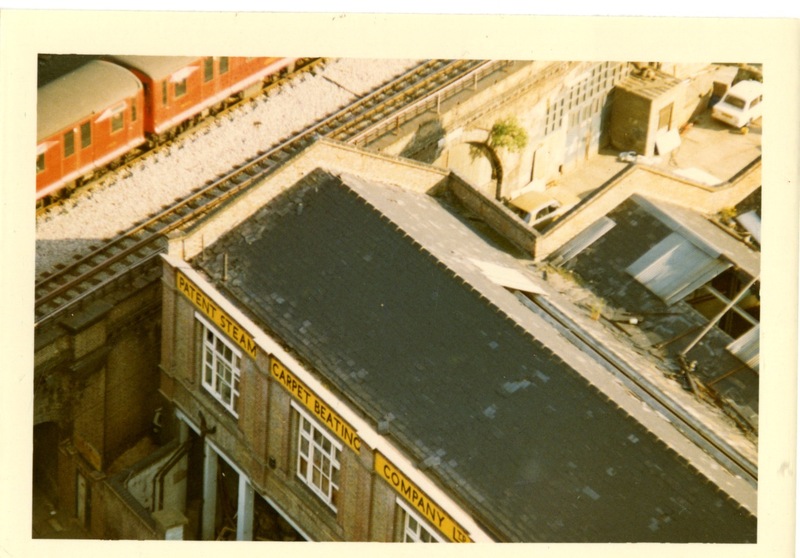 The Patent Steam Carpet Beating Company, right up against the railway arches in July 1971. Let’s just go off on a tangent for a moment and look at at a close up from one of the pictures above. On the Hammersmith side of the border just in front of those two towers you can see a pair of walkways which (I am informed by a local expert) were once an entrance way to the Franco British Exhibition at White City which remained in use for some time afterwards. But I won’t stray too far into someone else’s territory. Let’s get back on our own side of the border. About that truncated section of railway…. The end of the spur sat in an empty space. Selwyn’s job got him inside the fence. The concrete niches on the left are where the spur was blocked off. The tall building just off centre is the Phoenix Brewery towering above the just visible roof of the former Bramley Arms. If Selwyn turns around and looks in another direction (he’s marked them on the card the photos are glued to), this is what he sees. 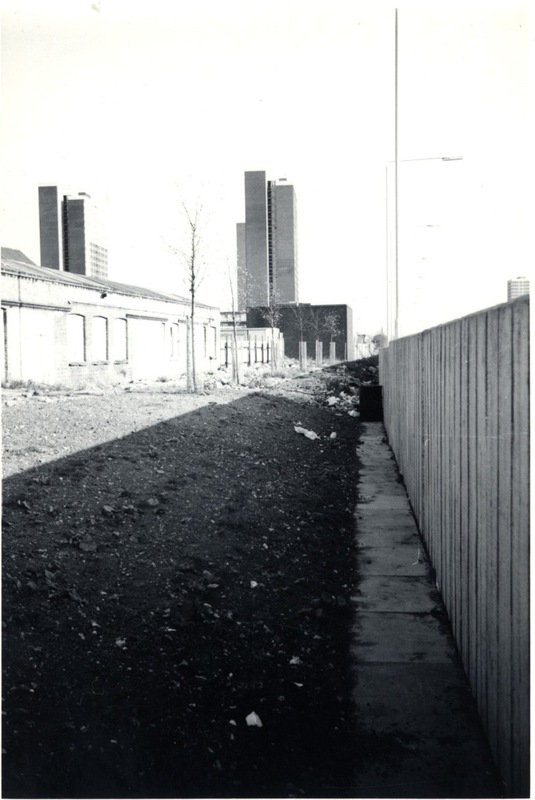 The gap in the fence where two men are walking is Bard Road and the industrial buildings beyond. 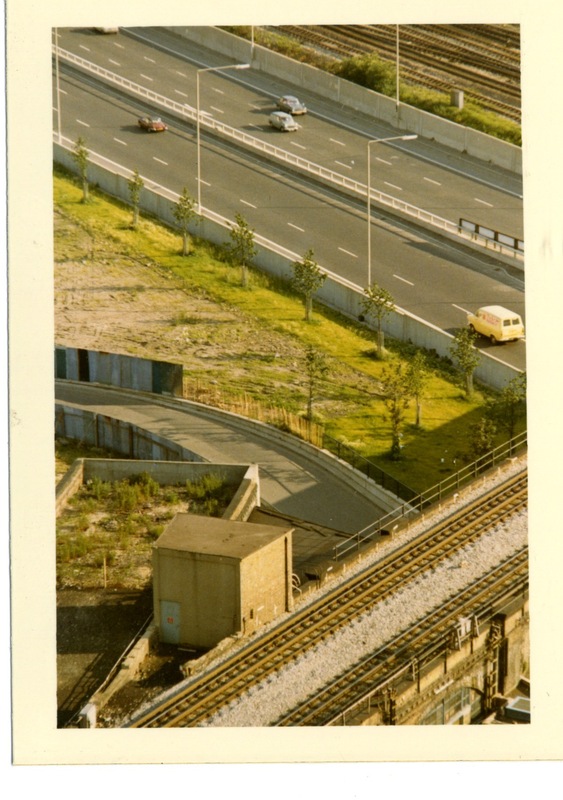 The narrow chimney is on the other side of the motorway in Hammersmith. Selwyn visited the area two or three times in 1971, sometimes with monochrome film in his camera. Another view south, from May this time, with the practically empty motorway. 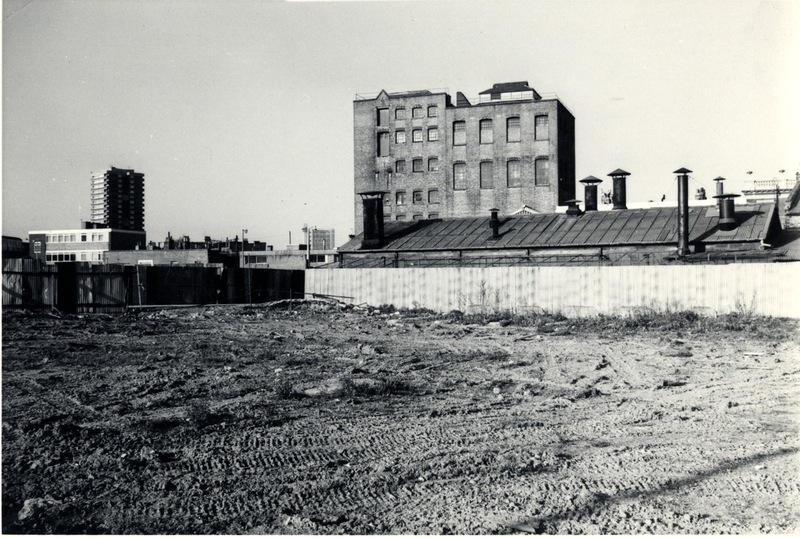 Looking north, back at the Brewery, and next to it, a then relatively new inhabitant of the west London skyline. 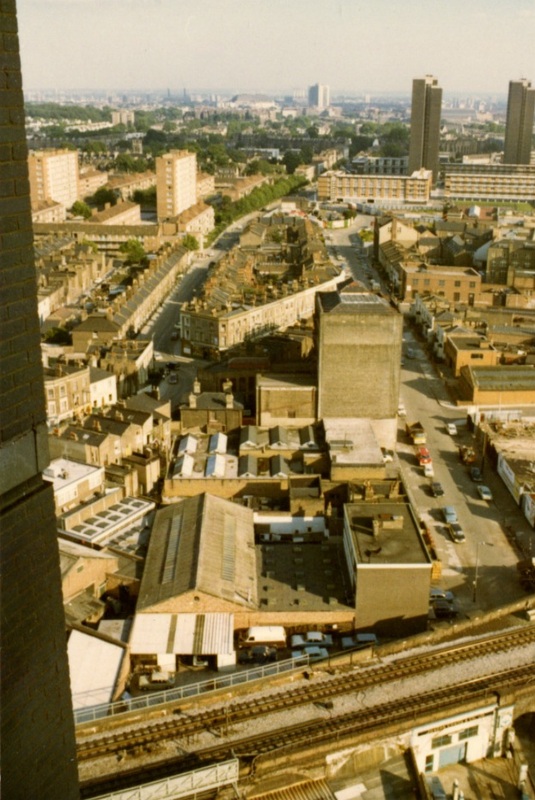 Trellick Tower, barely visible next to the brewery buidling but one of the tallest buildings in the area. Selwyn took more tiny prints of the area and taped them together to make larger images, a technique surveyors and planners made considerable use of in those days. I’ve left some of these images uncompressed so you can see more detail when you click on them. 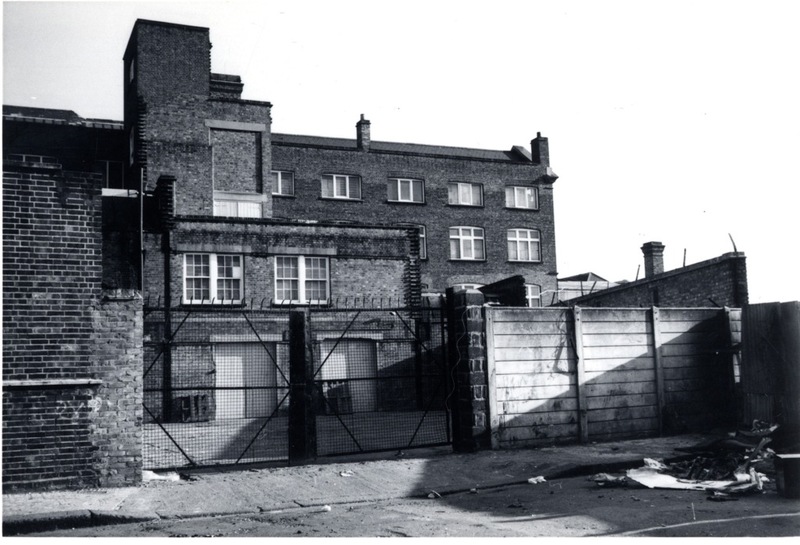 Selwyn hovered around that building on the left like an obsessed stalker. Waste paper blowing around in a deserted street in front of the locked gates. And now we’re skulking in the hidden spaces ourselves, the fence marking the edge of the new road. I have to admit that I was always prone to this mild form of urban exploration, as a teenager and even later. The interstices of the city. This is the area that later became known as Frestonia. I’ve touched on its history before and used some post-Selwyn views which add to the story in this post so forgive me for a bit of repetition. This shows a similar view to the first, with the spaces more crowded but relatively little change in the overall scene. 1980s? 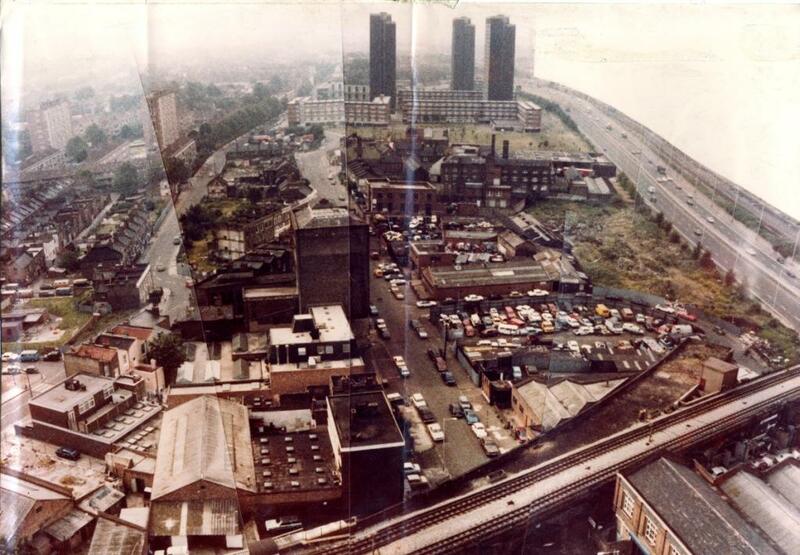 The view below, 1990s I think, shows a more developed, tidier area with some extra housing and more office buildings. Selwyn would have lived to see this view but he never recorded his thoughts. I would like to go back to Frinstead House and take some pictures myself but that’s not as easy as it used to be. 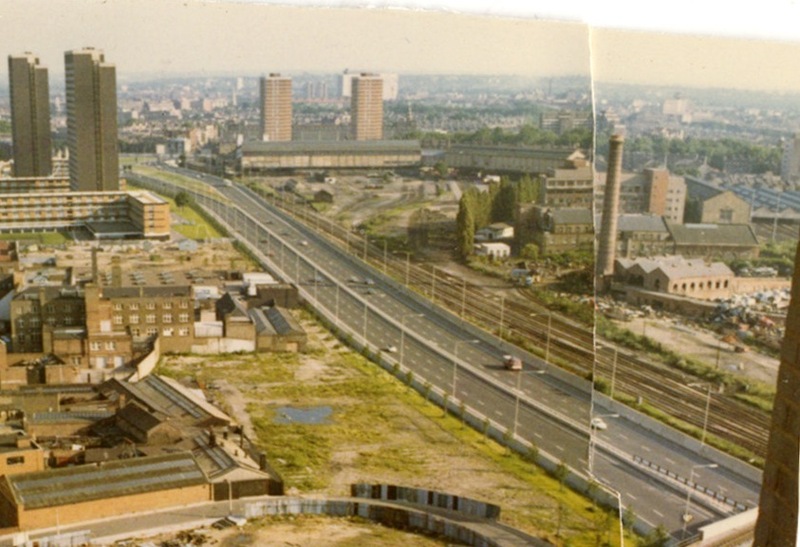 For a moment let’s go back to Selwyn in June 1971 looking down from his perch. Focus on that irregularly shaped block of houses just off centre near the top of the picture. Can you see a shop at the junction of two roads? We’ll be down there soon. If you can spot any errors in locations or directions please point them out. I’ve gone over them with a couple of local residents but you can never be completely sure you’ve got everything right. The follow-up post to this one which will come in a couple of weeks stays in the same area but goes down to street level. Thanks to Barbara and Maggie for their invaluable local expertise. There’s been some fuss about reactions to the recent death of Glenn Frey, formerly of the Eagles. After David Bowie was praised to the skies (by me also) why was Frey derided by some people? So I thought it only fair to say that although I was over the Eagles by the time of Hotel California I loved their first three albums (one of which was called On the Border) particularly Desperado, a definite country rock classic. And who could say bad things about a man who wrote one of the great lyrics in pop history: “Standing on the corner in Winslow Arizona / Such a fine sight to see / It’s a girl, my Lord, in a flatbed Ford / Slowing down to take a look at me” (Take it easy – Jackson Browne gave the song to Frey for the Eagles and he wrote many fine lyrics but Frey himself wrote those crucial lines. ) So thank you, and rest in peace Glenn Frey. This entry was posted on Thursday, February 4th, 2016 at 12:32 am	and tagged with Bard Road, Bernard Selwyn, Freston Road, Frestonia, Latimer Road and posted in 20th Century, North Kensington, Transport. You can follow any responses to this entry through the RSS 2.0 feed. Thanks Dave and those lyrics are still with me too!